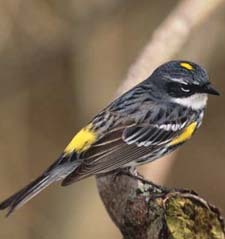 Yellow-rumped Warblers are impressive in the sheer numbers with which they flood the continent each fall. Shrubs and trees fill with the streaky brown-and-yellow birds and their distinctive, sharp chips. Though the color palette is subdued all winter, you owe it to yourself to seek these birds out on their spring migration or on their breeding grounds. Spring molt brings a transformation, leaving them a dazzling mix of bright yellow, charcoal gray and black, and bold white.